The article goes on to summarize the results of Greg and Ian’s IFP work. Read the whole article. Update 5/28/2009: From Jenny Rothenberg, Greenhouse Grower, Ken Post Lab Greenhouses… We will be selling geraniums Thursday 5/28 from 10-4 at the KPL Greenhouse on Tower Road. They are big showy plants with lots of flowers- red and white. $7.00 a pot. The greenhouse is located on Tower Road, diagonal from the dairy bar towards the vet school. (second driveway on the left). Graduation volunteers from the Department of Horticulture pose with their work at Schoellkopf Field stage. Viburnum leaf beetle invading NYC? John Jordan, Natural Resources Supervisor at Prospect Park Alliance has found evidence of the beetle there, and says that there was a confirmed report on North Brother Island (between Manhattan and Queens) last year. VLBs are suspected to be in some of the larger parks in the Bronx, northern Manhattan and northern Queens. Native plant enthusiast William Wyman has recorded damage in Delaware Township Hunterdon County, N.J., 70 miles west, and they’ve also been spotted in Putnam County, N.Y., 60 miles north. For more information on identifying VLBs at all life stages, steps you can take to manage them and choosing resistant viburnums, visit the Cornell’s Viburnum Leaf Beetle website. Metro area and New Jersey readers: If you spot VLBs in your area, please tell us where in the comments. One thing is clear: we can’t plant enough trees in cities to cleanse the air, even if the greens did provide the ecosystem service of filtering pollutants. But monitoring particulates where human activity occurs can certainly help us decide how to regulate for cleaner air. 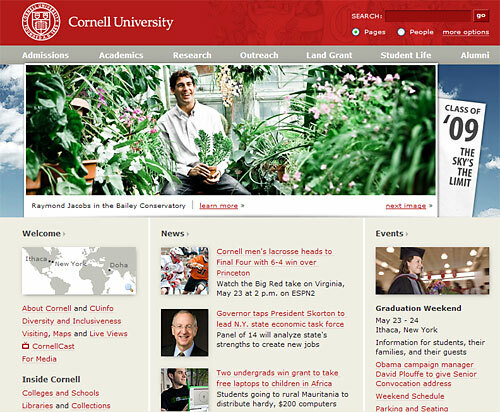 If you’ve visited the Cornell University homepage this week, chances are you saw a familiar face smiling at you from the banner: Raymond Jacobs, graduating senior, plant science major and president of Hortus Forum, the undergraduate student horticulture club. Jacobs was one of the seniors featured by the Cornell Chronicle in their annual series of stellar soon-to-be grads. 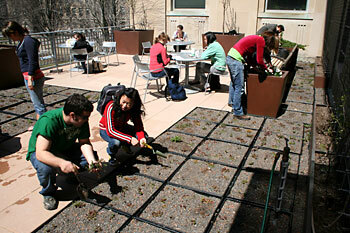 Being active in Hortus Forum, the undergraduate horticulture club. It grows and sells plants on campus, raising money for educational trips to explore the many areas of plant science. Besides meeting many of my closest friends through the club, Hortus Forum has provided a hands-on approach to learning that perfectly complemented my education in plant sciences. I was elected president of the club for my senior year and have learned a great deal through the challenges of this position. 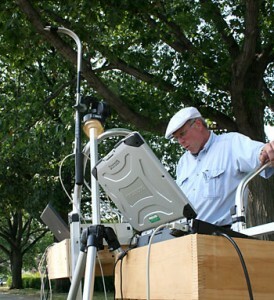 In additioni to profiling Tom Whitlow’s Beach Plum work, the newsletter details NESARE funding opportunities and summarizes research and education projects funded in 2009. “John Dyson ’65, past chair of the CALS Advisory Council, and Janet McCue, former director of Mann Library, oversaw the beautification of the space, once an unsightly concrete expanse. They worked with students in Peter Trowbridge’s landscape architecture class to design the garden, which will be maintained by Nina Bassuk, professor of horticulture, and her students. 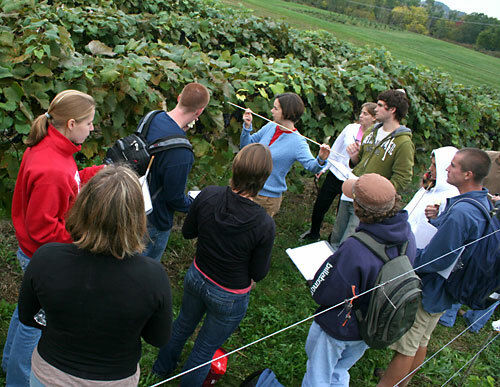 Justine Vanden Heuvel (center) teaches students how to assess grape canopy coverage at Cornell Orchards. 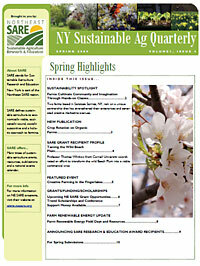 The Northeast Region of USDA’s Sustainable Agriculture Research and Education Program (SARE) has awarded $178,311 to a team of researchers, extension staff, and wine-grape growers to assess the economic and environmental benefits of canopy management in aromatic white wine grapes such as Riesling. Canopy management is a suite of practices that can help New York growers reduce fungicide use and improve grape flavor. “The difference in the wines can be like night and day,” says Justine Vanden Heuvel an assistant professor in both the Department of Horticulture in Ithaca and the Department of Horticultural Sciences at the New York State Agricultural Experiment Station, Geneva. Vanden Heuvel, the project’s principal investigator, adds that a big part of the project will be to determine how much more consumers are willing to pay for the wines to offset the extra expense of the canopy management. Unlike in the arid west, where vine growth is limited by scant moisture, grape vines in the Northeast run rampant, fueled by our better soils and more-than-adequate rainfall. But the rank growth holds moisture – encouraging disease – and shades the clusters – which need sun to develop the nuanced flavors that command higher prices when made into wine. By thinning shoots in May and removing leaves in the fruiting zone to expose clusters to sun after the fruit has set, most growers should be able to reduce fungicide use and improve the flavor and aroma profiles of their wine, hopefully increasing the price their wine can be sold for. ”In 2008, we saw much less botrytis in vineyards where growers used canopy management,” notes Vanden Heuvel. Vanden Heuvel’s team will be working with six growers, harvesting grapes from test plots with and without canopy management and making them in to wine at Cornell’s Vinification and Brewing Technology Laboratory in Geneva. The wines will be used in consumer preference studies, and a full economic analysis will determine the profitability of canopy management practices. “We can tell growers that they’ll have less disease and that their grapes will have better flavors and aromas with canopy management. But if they can’t sell the wine for more, there is little incentive to adopt these practices,” observes Vanden Heuvel. Thomas Bjorkman, vegetable- and cover-crop expert in the Department of Horticultural Sciences at the New York State Agricultural Experiment Station in Geneva, is heading up a project to help Northeast vegetable growers use cover crops to improve soil health. Björkman will train extension staff in New York, Pennsylvania, Massachusetts and Vermont to interpret Cornell Soil Health Test reports and to fill prescriptions from that test with the right cover crop. Extension staff will work with 43 growers to choose cover crops to solve their specific soil health problems and to test the effectiveness of the new practice. By identifying the cover crops best suited to specific management goals, growers will get more value from them and be able to improve both their environmental impact and their financial bottom line. This project builds on the success of the Cornell Soil Health Team to deploy the tools they developed, and to expand the management recommendations that result from the report. 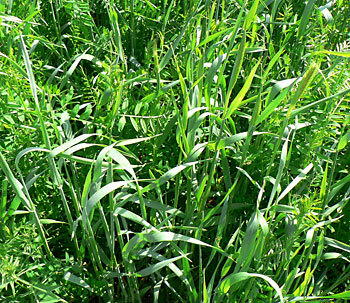 The management recommendations are available at the Cornell Cover Crop website. 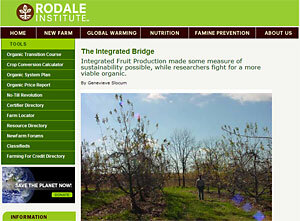 The $98,158-project is funded by the Northeast region of the USDA’s Sustainable Agriculture Research and Education program (SARE). For more information, contact Björkman: tnb1@cornell.edu. On May 14, graduate student Vinay Pagay (right) presented his Dreer Award seminar, chronicling his nearly year-long travels in China, India and Australia. More information on the Dreer Award.